To maintain the health and beauty of your trees, maintaining adequate oxygen levels in soils is a must. Most people observe the canopy of a tree and pay little attention to what is happening below ground. Proper soil structure, soil moisture and aerobic soils result in healthy root growth and an overall increase in plant health and vigor. In the urban environment, soils become compacted throughout the construction process over and within the critical root zones of trees and shrubs. Heavy construction equipment, materials and repeated foot traffic frequently traveling over or resting on top of a trees critical root zone can have detrimental, long term effects. Soils become compacted by such practices which reduce soil permeability and limit required oxygen and moisture available for trees and shrubs. Fill dirt brought onto construction sites can also smother roots and cause further compaction. The Aeration process requires using the Airspade tool to excavate 2”-3” diameter holes to a depth of 10”-12”, as able, every few feet within the Critical Root Zone of a tree. These holes will promote proper gaseous exchange to the root system and alleviates compaction within the soils. Aerating the soils within your trees critical root zones, along with other best practices, will help maintain a high level of plant health and vigor. The root collar is the area at the base of the tree where the trunk and root system meet. This area is defined as the flare at the base of the tree. Root collars, unlike the tissue of roots, are not tolerant of high moisture levels and require exposure. 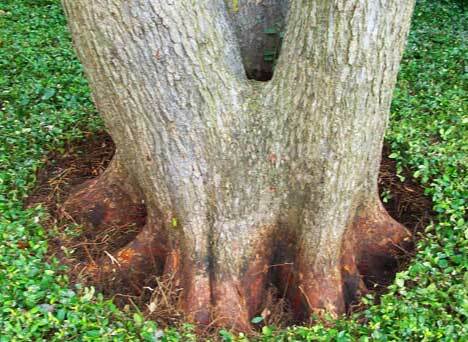 Buried root collars are more inclined to experience girdling roots which choke the tree itself. Wire baskets, twine and burlap left around the roots upon planting are other frequent causes of girdling root formation which restricts the movement of water, stored food reserves and plant nutrients throughout the tree. The root flare and trunk of a tree are not programmed to resist constant soil moisture. Since respiration occurs in this area of the tree and wet bark restricts or stops this breathing, Root Collar Exposure is crucial to the health of your tree. If left unattended, the restriction can cause the area to interfere with the downward movement of food to the roots and result in reduced water uptake, root dieback and a overall decline. Capitol Tree Care, utilizes a Airspade tool to remove excess soil using highly compressed air, minimizing physical damage to your tree incurred with hand tools or heavy excavation equipment. 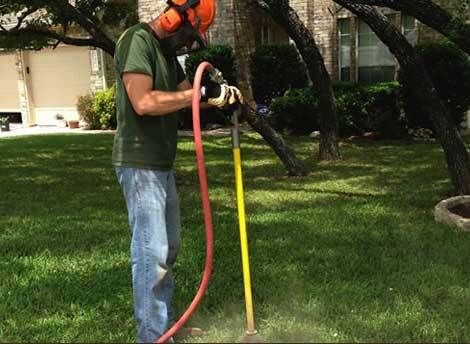 This process allows our technicians the ability to safely expose root collars and roots. The Airspade also allows a safe trenching technique when working within the critical root zone of a tree, exposing roots to work around or prune using a clean cut and a wound sealant.